Located in the Ballari district of Karnataka, Hampi is a site of great historical, religious as well as cultural importance. The historical monuments present within its boundaries boast of their mesmerising architectural beauty. Therefore, it is no wonder Hampi is one of the most popular UNESCO World Heritage Sites in India. Spread over an area of about 41 sq km in the midst of rocky hills and lush vegetation, Hampi is settled on the banks of the river Tungabhadra and is an ancient ruined city which is believed to be once the capital of the great Vijayanagara Empire between the 14th and 15th centuries. Today, it has become a popular tourist spot and is frequented by history lovers and travellers from all over the world. From temples to palaces and mosques to tombs, there are numerous historical buildings that will certainly appeal you on account of their historical as well as architectural prominence. So, if you would love to find yourself in the midst of historical aisles, then Hampi should be your next stoppage this season. Read on to know more about Hampi and how to reach it. 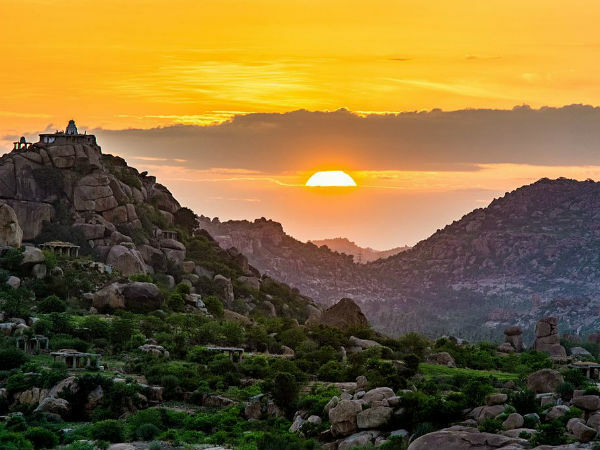 As the region in and around Hampi experiences an extremely hot weather, it is not a preferred destination amongst seasonal tourists during the summer season. For history lovers and architecture enthusiasts, Hampi is a year-round destination. However, if you are looking forward to avoiding the hot sun of Hampi, then the best time to visit it is from October until the end of February. By Air: The nearest airport to Hampi is located in Hubli at a distance of around 165 km. Once you have reached Hubli, you can hire a cab or catch a direct bus to reach Hampi. By Rail: Hampi doesn't have a railway station of its own. The best way to reach it by rail is by taking a train from Hyderabad to Hospet and then from there, a bus or a cab. Hospet is located at a distance of about 12 km from Hampi and is easily accessible. By Road: Being a UNESCO World Heritage Site, Hampi has a good system of roads. Therefore, one can easily reach it by road. As route 1 will take just 8 h, i.e., 1 h lesser comparison to the other route, it is the preferred route. On your way, you can also take a break at the following stoppages and savour their beautiful attractions. Mahbubnagar is located at a distance of around 102 km from Hyderabad and 270 km from Hampi and is generally famous as a weekend destination amongst locals. It is the place where you can witness and capture the beauty of Pillalamarri, the 700-year-old banyan tree. Over a period of time, the region around the tree has been converted into a picnic spot. You can also visit the nearby Dear Park which interests hundreds of visitors every day. Raichur is located at a distance of about 210 km from Hyderabad and 230 km from Hampi, and hence makes for an ideal en route stoppage. Blessed with lush green surroundings, rocky hills, forts and other historical monuments, Raichur is one of the least-explored yet enthralling destinations in Karnataka. It is settled between in the Tungabhadra and the Krishna rivers. The major places to visit here include Ek Minar Ki Masjid, Raichur Fort and Sri Nandishwara Temple. Once you are within the boundaries of Hampi after travelling a distance of about 370 km from Hyderabad, following are the major places you must visit to experience the best of its beauty. Even though most of the monuments and temples here are in ruins, they assuredly deserve to be explored on account of their architectural beauty and historical importance. Dedicated to Lord Shiva, Virupaksha Temple is the most visited and the most popular site in Hampi. It was built during the rule of the Vijayanagara Empire and is said to have been in existence since the formation of Hampi. Therefore, the temple attracts each and every kind of tourist. Your trip to Hampi would certainly be incomplete if you forget savouring its beauty. If Hampi has to be described in a sentence, then it would be - Hampi is a land of temples. Apart from Virupaksha Temple, there are several other beautiful temples which can definitely steal your heart. The list includes Krishna Temple, Narasimha Temple, Achyutaraya Temple, Vitthala Temple, Hemakuta Hill temples and Kodandarama Temple. Well, this is something which makes Hampi a unique place. Yes, you can also find several Muslim monuments within its boundaries, such as tombs and mosques. The most prominent amongst them is Ahmad Khan Mosque and Tomb. If you think Hampi is all about exploring historical monuments, then you are certainly wrong. To your surprise, there are a lot of other activities which can be done within its boundaries. You can go boating in the beautiful waters of the Tungabhadra river or climb the surrounding rocky hills. Cliff jumping and swimming are certain other activities which can be relished here. Anjaneya Hill, Lotus Mahal, Matanga Hill, Veerabhadra Temple, Ganagitti Jain Temple, Pampa Sarovar and Sanapur Lake are a few other tourist attractions here.